Start by cooking the rice according to the instruction on the package. When the rice is done, allow it to cool down a bit before making the rolls. When the rice is cooking, prepare the spicy mayo. Whisk together the ingredients in a bowl and set aside in the refrigerator until you are ready to serve. Prepare the shallots. Place the flour in a small bowl, and toss the sliced shallots with the flour. Place the oil in a deep saucepan and heat over medium-high heat. Have a slotted spoon and a paper towel lined plate nearby. Test the oil by tossing in a shallot, it should start to sizzle. When the oil is hot, carefully add in the shallots. Move them around with the slotted spoon just a little while they are cooking. They should take about 3-5 minutes to brown, and once they are a golden brown brown color transfer them to the paper town lined plate. 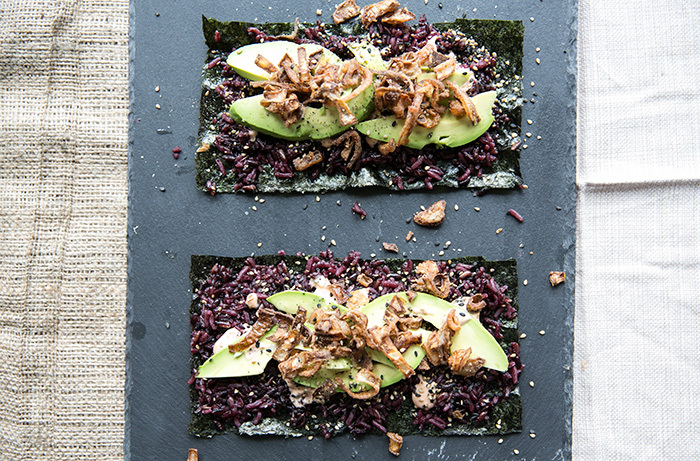 Lay the two sheets of nori out on a flat surface or a plate. Then, place a spoonful of the purple sticky rice onto the nori. Using your fingers, flatten the rice out so that it covers the entire piece of nori. If the rice sticks to your fingers, use some water to help release it. Then, layer the rest of the ingredients. 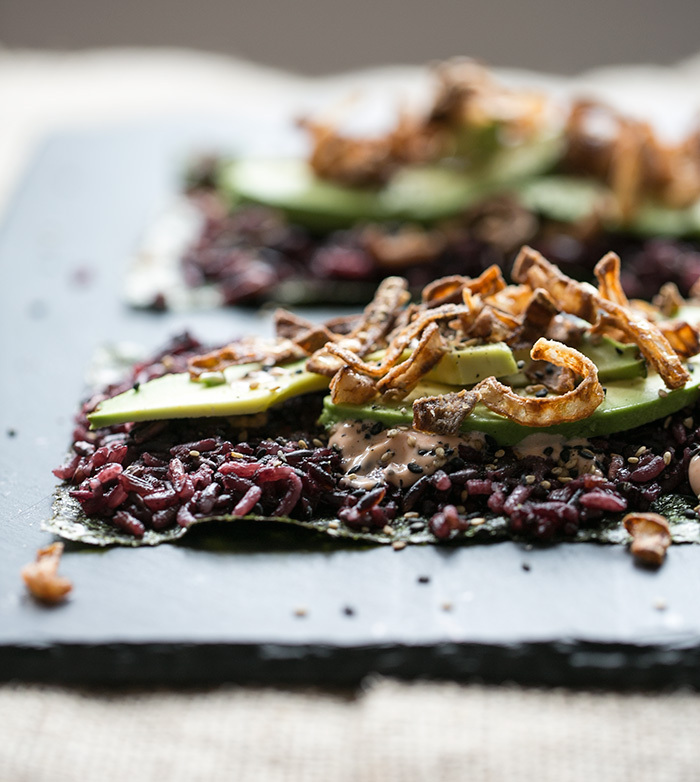 I like to do a layer of gomacio (or sesame seeds), then the avocado, then the spicy mayo, and top with the crispy shallots. To eat, I just like to carefully pick it up with my hands and fold it in half like a taco. Of course, if you are feeling ambitious you can roll this like you would a sushi roll if you have a sushi mat handy.